To advance research on income and subjective well-being (SWB), we review and synthesize the research on this topic. There is robust evidence showing a substantial association between income and SWB. However, addressing the question of whether income leads to happiness requires an explication of the underlying processes for how income may enhance or undermine happiness. A symbolic view of income (e.g., signaling status) proposes that income has little relation to SWB. On the other hand, a functional view of income (e.g., resource-buffer and a means for need fulfillment) proposes a stronger relation to SWB. In seeking to integrate this literature, we present a multilevel model of symbolic and functional views of income and SWB accounting for: (a) different levels of analysis; (b) income expenditure/distribution; and (c) the income generation context. The purpose is to provide an overarching conceptual model that captures the key factors influencing income and happiness that requires greater clarity and precision in order to advance future scientific endeavors. Although both societies and individuals strive toward material progress, with income being one of the key indicators, there is considerable debate on whether income leads to, or is substantially associated with, happiness. This has arisen in part due to different deeply held philosophical, religious, and ethical viewpoints. Value judgments on materialism and money notwithstanding, burgeoning empirical research on this issue from the fields of economics and psychology appear poised to resolve this debate. Yet surprisingly, scientists are similarly divided, with some holding up evidence that little relation holds while others point to a strong association. In our review of the literature, there is robust evidence showing a substantial association between income and subjective well-being (SWB). However, addressing the question of whether income leads to happiness requires an explication of the underlying processes for how income may enhance or undermine happiness. To this end, we review contrasting psychological and economic mechanisms that have been proposed to explain how income may (or may not) enhance happiness and clarify key moderators that need to be accounted for when empirically assessing this issue. By doing so, we shed greater light into the conditions for when income may or may not exert effects on SWB. In seeking to integrate this research, we present a multilevel model of income and SWB accounting for: (a) different levels of analysis; (b) income expenditure/distribution; and (c) the income generation context. The purpose is to provide an overarching conceptual model that captures the key factors influencing income and happiness which requires greater clarity and precision in order to advance future scientific endeavors. Seminal work by Easterlin (1974) found that although in the cross-section income is associated with happiness within nations, it was not associated between nations. Further, rising national income was not associated with rising levels of national happiness. To explain these findings, it was posited that an individual’s happiness level is contingent on the standard based on one’s society rather than an absolute standard across the world. Therefore, as evidenced, relative income within a nation has greater bearing on happiness than between nation income or increases in national income over time. The relative happiness hypothesis was challenged in a re-examination of the between-nation Easterlin data (Veenhoven, 1991). It was demonstrated that the between-nation correlation for income and SWB in the two data sets were not trivial with magnitudes of .51 (N = 14) and .59 (N = 9), respectively; when a larger number of countries were considered, the correlation was .84 (Veenhoven, 1991). It was argued that national happiness was highly correlated with national income and unlikely to be based solely on relative standing within the nation. Instead, it is more likely that happiness is based on the fulfillment of basic and psychological needs afforded by income, which is an absolute standard, rather than one’s relative income standing within a nation. This debate between the two viewpoints – relative versus absolute standards – has continued to the present day. However, the scope of the debate has narrowed as accumulated evidence shows that there is a substantial correlation at the nation level between income and happiness at above .80 (Deaton, 2008; Sacks, Stevenson, & Wolfers, 2012), with little to no evidence of satiation (Stevenson & Wolfers, 2013). Further, time-series and panel analyses of a large number of nations have shown a positive relationship between income and happiness over time (Diener, Tay, & Oishi, 2013; Sacks et al., 2012; Veenhoven & Vergunst, 2014). Currently, it is acknowledged that while in the short run income and happiness may be associated, it is argued that this association does not hold in the long run (10 years or more) as shown in 34 nations (Easterlin, McVey, Switek, Sawangfa, & Zweig, 2010). Different pieces of evidence point to valid arguments from both viewpoints: while there is strong evidence that absolute income contributes to happiness; it suggests that relative income plays a role in happiness over time. Another source contributing to the debate has stemmed from studies on individual-level income and happiness. Initial work on a small sample of lottery winners showed no long-term increases in happiness and this has been thought to show that individual income does not enhance happiness (Brickman, Coates, & Janoff-Bulman, 1978). Furthermore, meta-analytic evidence revealed a small effect size of .18 (k = 38) between household income and SWB (Howell & Howell, 2008). Despite these initial findings suggesting little to no relation between income and SWB, more recent work proposes otherwise. A longitudinal study with a random sample of about 33,000 individuals, has shown that after two years, lottery winners exhibited greater SWB as compared to non-lottery winners (Gardner & Oswald, 2007). Furthermore, it has been proposed that the correlational effect size between income and SWB can be misleading as it masks actual mean level differences between the rich and poor. Correlations as small as r = .09 correspond to a mean difference of d = .40 between the richest and poorest in representative nation samples; and a low correlation of r = .32 corresponds to a mean level difference of d = 1.23 between the richest and poorest (Lucas & Schimmack, 2009). Apart from debates on the predictor side of the equation, that is, whether income exerts changes to SWB, debates have also occurred on the outcome side of the equation; that is, whether SWB is changeable in the long-run. A key landmark heritability study on SWB demonstrated that test-retest correlations of SWB over 5 to 10 years has a heritability estimate of 80%, thereby supporting the claim that SWB is fairly immutable (Lykken & Tellegen, 1996). By extension, income effects would have little influence on SWB. Nevertheless, the heritability estimate of 80% is based on the stable variance over time which is around 50% of the total variance. Therefore, around 60% of the total variance in SWB has changed over time and the conclusion of immutability is too strong (Tay & Kuykendall, 2013). Overall, there is evidence that while SWB has some degree of stability, it is also malleable and can systematically change over time (Diener, Lucas, & Scollon, 2006; Tay & Kuykendall, 2013). In general, the evidence on balance is supportive of a robust relation between income and SWB (Frank, 2012; Veenhoven, 1991; Veenhoven & Hagerty, 2006). Yet, on many accounts, income does not seem to be as strongly related to happiness over time as we would intuitively suppose (Aknin, Norton, & Dunn, 2009). We propose that this is the consequence of concomitant contrasting effects. The relative viewpoint exemplifies the negligible effect of income on happiness (Clark, Frijters, & Shields, 2008; Easterlin, 1974; McBride, 2001) whereas the absolute viewpoint exemplifies the strong positive effect of income (Hagerty & Veenhoven, 2003; Sacks et al., 2012; Veenhoven, 1991; Veenhoven & Vergunst, 2014). Pointing to coexistent and concomitant effects, research has shown that adaptation occurs (attenuated income-SWB relation) in the long-run although income increases with happiness (Hagerty & Veenhoven, 2003). This example suggests that contrasting effects can both hold, but there may be instances or situations when one of these contrasting effects may be stronger or weaker (e.g., short-term versus long-term). Based on the debate and findings, we highlight several aspects that need to be recognized in organizing this integrative conceptual model. It is important to consider the contrasting posited mechanisms for how income may or may not lead to SWB. Critically, because this debate has emerged from primarily two different levels of analysis (viz. national-level and individual-level), the processes of how income may exert effects on SWB would require specificity at different levels. For instance, the issue of income distribution exerting effects on SWB pertains to communities and nations rather than individuals (Oishi & Kesebir, 2015). Moreover, it will also be critical to understand the moderating effects of national-level income on the relation between individual-level income and SWB (Tay, Morrison, & Diener, 2014). Beyond this debate, there is growing recognition that the way income is spent also contributes to whether individuals achieve SWB (Dunn, Aknin, & Norton, 2008). This issue of how income is spent and redistributed in society is also relevant at the national level (Diener et al., 2013). Finally, another key factor that has not been thoroughly considered is the context in which income is earned. It has been proposed that the cost of earning income is that it has to be earned and the work context may serve as a source of dissatisfaction (Kaun, 2005; Pouwels, Siegers, & Vlasblom, 2008). However, this issue appears to be more complex as organizational psychologists have shown that work can also be a major source of satisfaction depending on the job attributes (Hackman, Pearce, & Wolfe, 1978). By extension, at the national level, the type of labor market needs to be considered as well as a key confounding variable in the income-SWB model. Based on aforementioned issues, we propose that key factors for inclusion in the conceptual model include: (a) different levels of analysis; (b) income expenditure; and (c) the income generation context. A multilevel framework of the key mechanisms and moderators is presented in Figure 1. We will expound on aspects of these framework in the following sections. Specifically, we discuss the different contrasting mechanisms, income expenditure, and income generation context at both the individual and national level. In this section, we provide an organizing framework for understanding the differences in the relative versus absolute viewpoints of income and SWB. Instead of using the terms relative and absolute, which emphasizes social-cognitive mechanisms, we use the terms positive and nonpositive because these terms cover a broader array of mechanisms. We review and compare the contrasting mechanisms posited by the opposing viewpoints. In doing so, we consider what potential mediators and moderators may underlie the differences in perspective. This can serve to elucidate differences and enable a more rigorous examination of the income-SWB relation. Before presenting the specific mechanisms, however, it is useful to describe different views of income as this is pertinent understanding the proposed mechanisms. Views of income. We propose that that it is helpful to consider that income has both symbolic and functional properties. Income is symbolic because it can demonstrate social standing (e.g., socioeconomic status) and is a symbol of control, and even viewed as a symbolic resource to obtain love (De Vries, 2007). 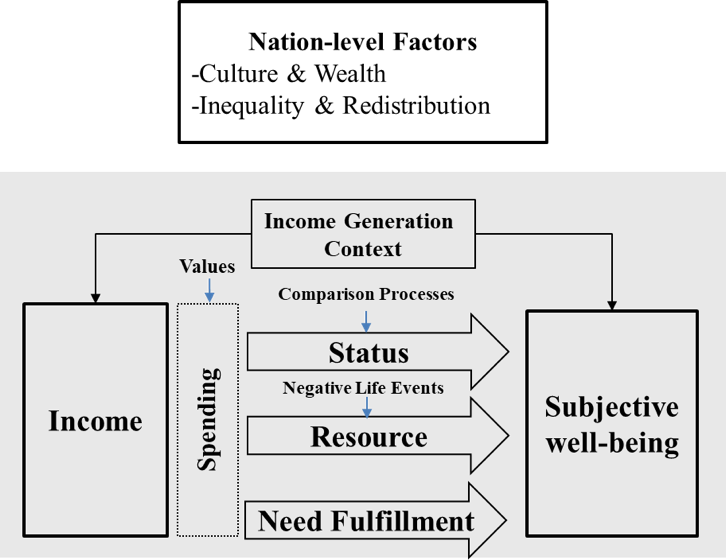 Income viewed in this manner corresponds to the first arrow in Figure 1 where income is primarily viewed in a symbolic manner (and high status goods are purchased to signal high income). Generally, a symbolic view of income corresponds to the idea that income does not have positive effects on SWB. Having more income increases SWB, comparison effects reduce the positive effects to nugatory in the long run. The functional property of income is demonstrated in two ways: (1) as a resource that buffers against major life events (e.g., illnesses, unemployment), daily life hassles, and inconveniences (e.g., purchase of help); and (2) as a means to obtain goods and services that are need fulfilling (Diener et al., 2013; Tay & Diener, 2011). Generally, an emphasis on the functional view of income is often tied to a positive perspective where income enhances SWB. Points (1) and (2) correspond to the “Resource” and “Need Fulfillment” arrows in Figure 1, respectively. Generally, a functional view of income corresponds to the positive view of income on SWB. Uncovering these viewpoints about income will serve as a focal point linking the different mechanisms outlined. In the following, we discuss the three mechanisms of status, resource, and need fulfillment. The moderators for status and resource mechanisms are comparison processes and negative life events, respectively. These variables are presented in Figure 1. Status. Income has direct positive effects on SWB through its symbolic value such that, in comparison to the poor, individuals with higher income would be happier. Apart from the raw value of income, this could also occur through the purchase of status-building commodities. For instance, conspicuous consumption is primarily meant to signal high income and greater social status (Corneo & Jeanne, 1997). However, it has been argued that the symbolic value of income can be unhinged from the objective value of income because of inherent subjectivity. This is because happiness is fundamentally dependent on the extent objective income is higher than subjective standards for income, but these subjective standards continually change with context and income level (e.g., Easterlin, 1974). Specifically, the potentially positive status effect of income is substantially moderated by comparison processes such that any positive effects on SWB are negated. How are comparison processes enacted over different contexts and income levels? With regard to context, a key driver of changing standards is social comparison. It is proposed that the proximal social context in which an individual is situated provides the referent point for acceptable levels of income. For example, the standard of income may be dependent on one’s living context so that the affluence of neighborhoods may have negative effects on SWB over and above individual income (e.g., Luttmer, 2005). Nevertheless, proximal social contexts may exert different effects from macro-contexts. It has been shown that the affluence of nation contexts have positive effects on life satisfaction over and above individual income (Tay, Morrison, et al., 2014). With regard to income, it has been proposed that the higher the income, the higher the aspiration. Therefore, the gap between levels of income and aspired levels of income hinders the extent happiness can be increased through a rise in income (Frey & Stutzer, 2002). Moreover, as income rises, the referents for social benchmarking changes. Indeed, Duesenberry (1949) proposed that individuals tended to compare their own income to the income of others with a similar or higher status. Corresponding research shows that income comparison effects are asymmetric and primarily upward (Ferrer-i-Carbonell, 2005). Finally, as income rises, consumption habits may also change, leading to appetites for better goods and services, thereby raising standards for income (Hudders & Pandelaere, 2011). The status effect and the moderating comparison processes discussed so far pertain to the individual level as they are psychological in nature. At the nation level, the direct relation between income and SWB is complex. On one hand, it has been proposed that income comparisons occur within a nation leading to positive within-country income-SWB relations but a negligible income-SWB relation between countries (Easterlin, 1974). This assumes that residents within a country have a common national standard by which to compare income to. On the other hand, the rationale for limited direct effects because of changing standards implies that individuals use more proximal standards (i.e., high income individuals use other high income individuals) or more personal standards (i.e., personal aspiration based on income level), with research showing that there is diversity in the reference group (Oswald & Senik, 2010). If such specific proximal/personal standards are used, when aggregating to the nation level, we would expect the effects of income to be limited. Yet, empirical studies show that the between-country income-SWB relation is estimated at r = .84 (Veenhoven, 1991). This suggests that comparisons may even occur on a common global standard due to globalization and media access (Diener et al., 2013). Resource. Apart from its symbolic value, income can also be viewed as a resource. Drawing on Conservation of Resource theory (Hobfall, 1989, 2002), individuals seek to acquire and maintain resources. The possession of resources can exert positive effects on well-being and buffer against negative life events; a reduction in resources however can exert negative effects on well-being. Therefore, income can generate well-being and buffer against stress generated from negative events (e.g., accidents, unemployment). On the other hand, having low income or experiencing a loss of income will be detrimental to well-being. Past research has shown that having the resource of money was predictive of life satisfaction (r = .30) and its magnitude not far behind social resource (r = .40) (Diener & Fujita, 1995). As a resource, income can also serve to overcome inconveniences and hassles thereby improving or maintaining happiness as individuals can engage in more enjoyable activities and obtain paid help for less enjoyable activities such as chores (cf. Kahneman, Krueger, Schkade, Schwarz, & Stone, 2004). A key moderator of income from a resource-buffering perspective would be the degree to which individuals experience negative life events. High income individuals who have a large pool of financial resources are protected from life “shocks” by maintaining or compensating for negative life events or conditions. For instance, Philippe Pozzo di Borgo became a paraplegic after a car accident. However, due to his wealth, he was able to maintain his quality of life by obtaining the service of a full-time domestic assistant. As such, the resource view of income is indicative of an ameliorative function (i.e., a safety net) such that downturns more visibly reveal the relation between income and happiness. A further consideration when viewing income as a resource is that the strength of effects may be modulated by the level of income. At higher levels of income, where income serves primarily as a resource-buffer, the accumulation of wealth may not exert strong direct effects as these effects are contingent on the occurrence of negative life events and serve an ameliorative function. Therefore, at the upper range of income levels, we may not see robust income effects. On the other hand, at low levels of income, individuals would constantly experience stress and lowered SWB because of the insecurity of insufficient financial resources according to Conservation of Resource theory. This may even be compounded with negative life events. As such, at lower levels of income, we would observe stronger direct effects of income on SWB. Need fulfillment. From both organismic (Maslow, 1943) and evolutionary perspectives (Kenrick, Griskevicius, Neuberg, & Schaller, 2010), money can be viewed as a means to obtain payment for goods and services and possessing higher income can enable individuals to fulfill physical and psychological needs. The idea that need fulfillment is tied to well-being has been borne out in multiple studies (Oishi, Diener, Lucas, & Suh, 1999; Sheldon, Elliot, Kim, & Kasser, 2001). Strong evidence for this idea was demonstrated in a global study of 124 nations, where the effects of income were fully mediated by the fulfillment of basic and psychological needs (Tay & Diener, 2011). At the national-level, it has been shown using cross-lagged analyses that national income predicts SWB, but not the converse. Importantly, when income rises along with national need fulfillment, there is a greater increase in SWB (Diener et al., 2013). This suggests that income increases SWB via need fulfillment at both the individual and nation level. Comparison of perspectives and mechanisms. Differences in the perspectives and the mechanisms provide an integrative view of how income may lead to happiness – and the moderators that potentially affect the causal strength. There appears to be a weaker proposed effect of income when viewed as symbolic compared to functional. The symbolic view emphasizes status is a means for enhancing SWB, but comparison effects reduce the positive effects. Although if comparison effects are based on global standards due to globalization, income may still be linked to SWB. The functional view espouses income as a potential resource that could provide security and buffer against potential negative events, and as a means to fulfill fundamental human needs. Between the mechanisms of resource and need fulfillment, stronger arguments can be made for need fulfillment as exerting more robust effects on SWB. Resources fundamentally serve to provide some level of basic security and ameliorative function in hardship but do not address a range of psychological needs that would lead to greater happiness. While past work has often focused on whether income is associated with or leads to SWB, a critical mediator of how income is spent – as shown in Figure 1 – has recently attracted more attention (Dunn, Gilbert, & Wilson, 2011). We believe that this variable is crucial because it specifies how income is allocated among the different mechanisms (e.g., status, resource, need fulfillment) – which may or may not have strong promotional effects on SWB. At the individual level, when income is symbolically used and allocated toward increasing status, its effects on SWB are weaker compared to allocating to as a resource or toward need fulfillment. An experimental study has shown that reminding individuals of wealth reduces the extent individuals savor experiences, which refers to the enhancement or prolongment of positive emotional experiences (Quoidbach, Dunn, Petrides, & Mikolajczak, 2010). On the other hand, when income is allocated as a resource, its effects are made especially manifest by buffering against negative events. The salutary effect on SWB of the resource mechanism is not as pronounced as when it serves to protect decrements in SWB. Finally, when income is allocated toward need fulfillment, positive effects are likely to hold. The current literature on spending demonstrates that prosocial spending can promote happiness (Dunn et al., 2008). This relationship between autonomous prosocial behaviors – which would include prosocial spending – has been shown to be mediated through psychological need satisfaction (Weinstein & Ryan, 2010). In our model, values are a potential moderator of spending patterns. Individuals who have greater values and identity placed on prestige would allocate income toward conspicuous consumption (Ottmar & Wicklund, 1989). Emphasizing appearances of financial success could be lead to habitual compulsive purchases that do not promote SWB in the long term (Roberts & Pirog, 2004). By contrast, individuals who place less value in these would place more emphasis the functional aspects of income rather than the symbolic aspect of income. As a resource, individuals who develop values toward thrift would likely allocate income into savings (Anderson & Nevitte, 2006). Further, prosocial values would direct individuals toward spending on others that can fulfill needs of autonomy, relatedness, and competence which promote SWB (Weinstein & Ryan, 2010). We note that values themselves provide an implicit or explicit weighting of what matters to individuals for their well-being. Individuals with higher levels of extrinsic work motivation (i.e., working for pay and rewards) exhibited a strong relation between income and SWB than individuals with intrinsic motivation (Malka & Chatman, 2003). Further, individuals living in richer nations, which likely emphasize income, demonstrated a stronger association between personal income and SWB (Tay, Morrison, et al., 2014). While this may reduce some of the effects of allocation between income and SWB, this does not completely negate the effects. At the national level, values can also guide how nations spend and distribute the financial resources which in turn has effects on SWB. In a review of inequality and SWB (Tay, Oishi, & Diener, 2017), cross-sectional, and longitudinal evidence revealed associations between income inequality and lower life satisfaction. An analysis of the Gallup World Poll of 163 nations (2005 to 2013) showed that the GINI index calculated from annual household income correlated -.44 with national life satisfaction (Diener & Tay, 2015). Moreover, a cross-national study found that greater national progressive taxation was related to higher life satisfaction and this association was in part mediated by availability of affordable housing, public transportation system, education system, and even air quality (Oishi, Schimmack, & Diener, 2012). This strongly suggests that how nations spend and distribute their financial resources will matter for SWB. A key issue that is often neglected in understanding the relation between income and SWB is the income generation context. At the individual level, for a large proportion of people, full-time or part-time employment is the primary means by which they earn their income. At the same time, these same individuals spend a large proportion of their waking hours at work. Therefore, it is important to examine how this income generation context can possibly lead to both income and (un)happiness. This is analogous to the idea that individual differences may lead to the association between both wealth and SWB (Luhmann, Schimmack, & Eid, 2011). From the context of work, income and SWB may be positively related because the types of jobs that pay more also provide greater psychological need fulfillment. From the perspective of the Job Characteristics Model (Hackman & Oldham, 1976), high-paying professional and management-level jobs often have characteristics such as skill variety, task significance, task identity, autonomy, and feedback, resulting in greater fulfillment of psychological needs and hence SWB. In this sense, it may be that income and SWB are reflections of the type of work one engages in. This is not to suggest that higher income would not lead to greater job satisfaction and overall SWB, as pay satisfaction and pay equity are important components of overall satisfaction (Hulin, 1991). Higher income jobs may also be tied to higher prestige occupations. In seeking to disentangle the effects of income and work status, Di Tella and colleagues (2010) found that status change in terms of occupational prestige had more robust and longer lasting effects on happiness as compared to income change (Di Tella, Haisken-De New, & MacCulloch, 2010). This suggests that to the extent that income and occupational prestige are tied together, we would observe a stronger relation between income and happiness. It also suggests that the prestige of the occupation may be more proximal to happiness than income itself. Conversely, there alternate reasons to suspect that income may also be detrimental to SWB. This is because income as an extrinsic reward of work has been argued to be ultimately dissatisfying for individuals according to Self Determination Theory (Ryan & Deci, 2000). Further, having goals for financial success at work can undermine more important needs such as relatedness (Kasser, 2002). Another reason for why income does not lead to happiness is framed from a motivational perspective whereby the narrow pursuit of income-generation activities through work may be at the expense of other key happiness inducing life domains such as leisure and family. It has been proposed that because of higher opportunity costs of time use, individuals often forsake relationships and even health (Becchetti, Trovato, & Bedoya, 2011; De Vries, 2007). For example, it has been shown that individuals primed with money spent more time working rather than socializing (Mogilner, 2010); they also spent less time savoring experiences (Quoidbach et al., 2010). At the national level, the income generation context may be represented by the national labor force (i.e., participation in labor, and the types/levels of occupations) and types of industries (i.e., broad occupational contexts) in which most individuals within the national economy are in. In addition, there needs to be a consideration of employment rates within the population as these labor market conditions also predict national SWB (Tay & Harter, 2013). Future research needs to consider whether controlling for these factors will show a similarly robust and strong relation between GDP per capita and SWB at the national level (Diener, Ng, Harter, & Arora, 2010). The review and synthesis of the literature has also led to new questions that we have about income and SWB both methodologically and conceptually. We note several issues to consider for future research. Foremost, while most of the research has been on income and SWB, there has been a recognition that income is only one aspect of wealth, more broadly reflecting the economic circumstance of individuals and societies. Some research has now shown that both income and wealth predict SWB (Headey & Wooden, 2004), although it appears that the relation between broader economic status variables have a greater relation to SWB (Howell & Howell, 2008). This suggests that research should consider the wealth-SWB relation (e.g., Fischer, 2007) and other types of economic status variables such as consumption (Headey, Muffels, & Wooden, 2007), debt (Tay, Batz, Parrigon, & Kuykendall, 2016), and spending (Dunn et al., 2011). Given the multilevel context of income and SWB, an important aspect to consider in examining national, community, or group level income is the distribution of income among members. The way income is distributed or skewed can have differential effects over and above the average level of income on SWB (Berg & Veenhoven, 2010; Diener & Tay, 2015). The other implication is in deciding whether the mean or median is a better representation of group level income. In an examination of the neighborhood income, it was presented that median rather than mean level income was a better proxy for studying the effects of neighbor income effects on personal happiness (Firebaugh & Schroeder, 2009). Others have conceptualized the importance of the range and skew of income within a community as affecting personal happiness (Hagerty, 2000). The idea of income distribution should also lead to care when targeting specific groups of individuals as the relation between income and SWB may be attenuated due to range restriction. For example, research has shown that the relation between income and SWB is low in extremely poor and moderately poor groups (Lever, 2004). A multilevel understanding of income and SWB should also help researchers to consider the national and community contexts in moderating the effects of income and SWB. Past research has shown that national income boosts life satisfaction in wealthier nations beyond personal income (Tay, Morrison, et al., 2014). This is likely because national income provides infrastructure and conveniences that poorer nations do not have. However, at the level of communities, higher levels of community income appear to lower SWB due to social comparison effects (Firebaugh & Schroeder, 2009; Luttmer, 2005). More research will need to further examine the extent national or community contexts exert positive or negative effects on SWB beyond personal income. As suggested in Figure 1, a multilevel context implies a consideration of culture as well. This may moderate the effects that are found in the relation between income and SWB. For instance, Caporale and colleagues (2009) found that the income reference group effect on happiness was negative for Western Europeans, but it was positive for Eastern Europeans (Caporale, Georgellis, Tsitsianis, & Yin, 2009). This may be because Eastern Europeans may regard a higher income within their reference group as a source of inspiration. This parallels a more recent finding that hope mediates that link between a positive relation between inequality and happiness in rural China, but not urban China (Cheung, 2015). The strongest effects found for income and SWB are primarily for life satisfaction as compared to the affective components of SWB, which include positive and negative emotions (Diener et al., 2010). In part, this may be because of income satiation effects on the affective dimensions of SWB as compared to the evaluation dimension of SWB (Kahneman & Deaton, 2010). Further, evaluations may be more closely linked to external global conditions as opposed to personal daily circumstances which are more closely linked to affect (Tay, Chan, & Diener, 2014). More research needs to examine how income can be effectively used in daily circumstances to promote SWB, including prosocial spending (Dunn et al., 2008) and experiential spending (Van Boven, 2005; Van Boven & Gilovich, 2003) to even investing in structural changes that can reduce daily hassles and increase conveniences (e.g., reducing commuting time). Finally, another important aspect to consider is the valence of income and SWB as a possible moderator. Given that people are loss averse (Kahneman & Tversky, 1979), income gains over time may be less likely to raise SWB to the same degree as compared to losses in income. Indeed, there is now evidence that there is an asymmetry between the impact of economic gains and economic declines at the national level over time, with economic declines exerting twice the effect of economic gains (De Neve et al., 2015). Future research should seek to further validate this at the level of individuals over time. In addition, one can examine whether the impacts are similar depending on the valence of SWB indicators (e.g., positive vs. negative affect). Using a single measure of life satisfaction, there is some evidence that income is not as strongly related to high satisfaction, but more related to reducing dissatisfaction (Boes & Winkelman, 2010). Interest and research on income and SWB has grown over the decades and we expect that this trend will continue to grow. Understanding and explicating when and how income will give rise to SWB will strengthen scientific knowledge and policy implications. We hope that this review and synthesis into a multilevel conceptual framework will advance research and understanding of this domain. Aknin, L. B., Norton, M. I., & Dunn, E. W. (2009). From wealth to well-being? Money matters, but less than people think. Journal of Positive Psychology, 4, 523-527. Anderson, L. C., & Nevitte, N. (2006). Teach your children well: Values of thrift and saving. Journal of Economic Psychology, 27, 247-261. Becchetti, L., Trovato, G., & Bedoya, D. A. L. (2011). Income, relational goods and happiness. Applied Economics, 43, 273-290. Berg, M., & Veenhoven, R. (2010). Income inequality and happiness in 119 nations: In search for an optimum that does not appear to exist. In B. Greve (Ed. ), Social policy and happiness in Europe (pp. 174-194). Cheltenham, UK: Edgar Elgar. Boes, S., & Winkelman, R. (2010). The effect of income on general life satisfaction and dissatisfaction. Social Indicators Research, 95, 111-128. Clark, A. E., Frijters, P., & Shields, M. A. (2008). Relative income, happiness, and utility: An explanation for the Easterlin Paradox and other puzzles. Journal of Economic Literature, 46, 95-144. Corneo, G., & Jeanne, O. (1997). Conspicuous consumption, snobbism and conformism. Journal of Public Economics, 66, 55-71. Deaton, A. (2008). Income, health, and well-being around the world: Evidence from the Gallup World Poll. Journal of Economic Perspectives, 22, 53-72. Diener, E., & Tay, L. (2015). Subjective well-being and human welfare around the world as reflected in the Gallup World Poll. International Journal of Psychology, 50, 135-149. Duesenberry, J. (1949). Income, saving, and the theory of consumer behavior. (Harvard economic studies; v. 87). Cambridge: Harvard University Press. Easterlin, R. A. (1974). Does economic growth improve the human lot? In P. A. David & M. W. Reder (Eds. ), Nations and households in economic growth (pp. 89-125). New York: Academic Press. Easterlin, R. A., McVey, L. A., Switek, M., Sawangfa, O., & Zweig, J. S. (2010). The happiness-income paradox revisited. Proceedings of National Academy of Sciences, 107, 22463-22468. Ferrer-i-Carbonell, A. (2005). Income and well-being: An empirical anlaysis of the comparison income effect. Journal of Public Economics, 89, 997-1019. Firebaugh, G., & Schroeder, M. B. (2009). Does your neighbor's income affect your happiness? American Journal of Sociology, 115, 805-831. Frey, B. S., & Stutzer, A. (2002). Happiness and economics. Princeton, NJ: Princeton University Press. Gardner, J., & Oswald, A. J. (2007). Money and mental wellbeing: A longitudinal study of medium-sized lottery wins. Journal of Health Economics, 26, 49-60. Hackman, J. R., Pearce, J. L., & Wolfe, J. C. (1978). Effects of changes in job characteristics on work attitudes and behaviors: A naturally occuring quasi-experiment. Organizational Behavior and Human Performance, 21, 289-304. Hagerty, M. R. (2000). Social comparisons of income in one's community: Evidence from national surveys of income and happiness. Journal of Personality and Social Psychology, 78, 764-771. Hagerty, M. R., & Veenhoven, R. (2003). Wealth and happiness revisted - Growing national income does go with greater happiness. Social Indicators Research, 64, 1-27. Headey, B., & Wooden, M. (2004). The effects of wealth and income on subjective well-being and ill-being. Economic Record, 80, S24-S33. Hobfall, S. E. (1989). Conservation of resources: A new attempt at conceptualizing stress. American Psychologist, 44, 513-524. Hobfall, S. E. (2002). Social and psychological resources and adaptation. Review of General Psychology, 6, 307-324. Howell, R. T., & Howell, C. J. (2008). The relation of economic status to subjective well-being in developing countries: A meta-analysis. Psychological Bulletin, 134, 536-560. Hulin, C. L. (1991). Adaptation, persistence, and commitment in organizations. In M. D. Dunnette & L. M. Hough (Eds. ), Handbook of industrial and organizational psychology (Vol. 2, pp. 445-505). Palo Alto, CA: Consulting Psychologist Press. Kahneman, D., Krueger, A. B., Schkade, D. A., Schwarz, N., & Stone, A. A. (2004). A survey method for characterizing daily life experience: The Day Reconstruction Method. Science, 1776, 1776-1780. Kasser, T. (2002). The high price of materialism. Cambridge, MA: MIT Press. Lever, J. P. (2004). Poverty and subjective well-being in Mexico. Social Indicators Research, 68, 1-33. Lucas, R. E., & Schimmack, U. (2009). Income and well-being: How big is the gap between the rich and the poor? Journal of Research in Personality, 43, 75-78. Luhmann, M., Schimmack, U., & Eid, M. (2011). Stability and variability in the relationship between subjective well-being and income. Journal of Research in Personality, 45, 186-197. Luttmer, E. F. P. (2005). Neighbors as negatives: Relative earnings and well-being. The Quarterly Journal of Economics, 120, 963-1002. McBride, M. (2001). Relative-income effects on subjective well-being in the cross-section. Journal of Economic Behavior and Organization, 45, 251-278. Oishi, S., Diener, E., Lucas, R. E., & Suh, E. (1999). Cross-cultural variations in predictors of life satisfaction: Perspectives from needs and values. Personality and Social Psychology Bulletin, 25, 980-990. Oswald, A. J., & Senik, C. (2010). Who compares to whom? The anatomy of income comparisons in Europe. The Economic Journal, 120, 573-594. Ottmar, L., & Wicklund, R. A. (1989). Psychological antecedents of conspicuous consumption. Journal of Economic Psychology, 10, 161-187. Roberts, J. A., & Pirog, I. S. F. (2004). Personal goals and their role in consumer behavior: The case of compulsive buying. Journal of Marketing and Practice, 12, 61-73. Sacks, D. W., Stevenson, B., & Wolfers, J. (2012). The new stylized facts about income and subjective well-being. Emotion, 12, 1181-1187. Sheldon, K. M., Elliot, A. J., Kim, Y., & Kasser, T. (2001). What is satisfying about satisfying events? Testing 10 candidate psychological needs. Journal of Personality and Social Psychology, 80, 325-339. Stevenson, B., & Wolfers, J. (2013). Subjective well-being and income: Is there any evidence of satiation. CESifo working paper, No. 4222. Tay, L., Oishi, S., & Diener, E. (2017). Economic inequality and societal well-being. Under review at American Psychologist. Van Boven, L. (2005). Experientialism, materialism, and the pursuit of happiness. Review of General Psychology, 9, 132-142. Veenhoven, R., & Hagerty, M. (2006). Rising happiness in nations 1946-2004: A reply to Easterlin. Social Indicators Research, 79, 421-436. Veenhoven, R., & Vergunst, F. (2014). The Easterlin illusion: Economic growth does go with greater happiness. International Journal of Happiness and Development, 1, 311-343. Weinstein, N., & Ryan, R. M. (2010). When helping helps: Autonomous motivation for prosocial behavior and its influence on well-being for the helper and recipient. Journal of Personality and Social Psychology, 98, 222-244.